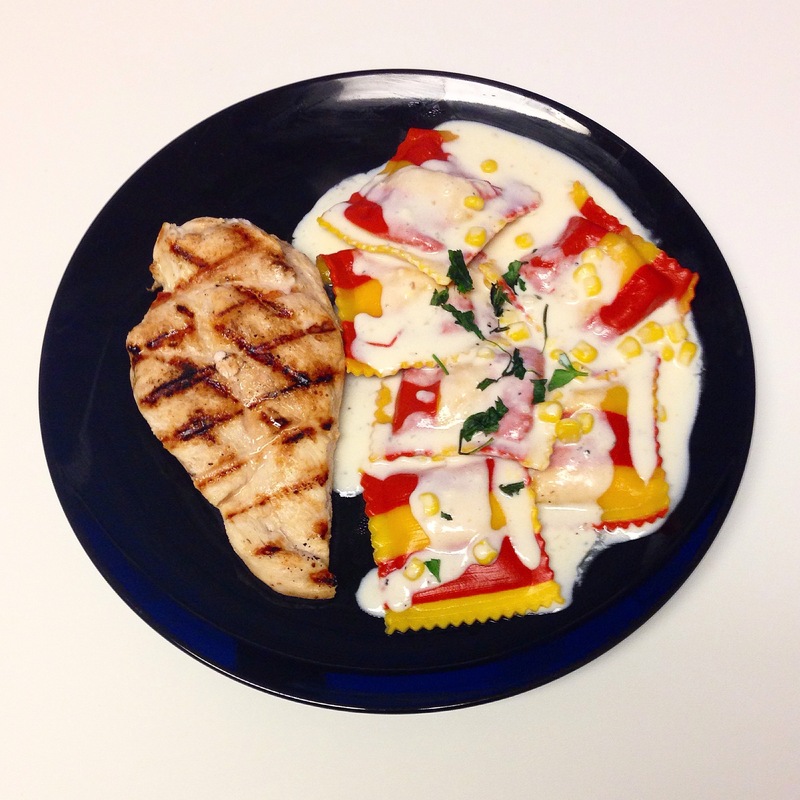 A Little Land and Sea: Grilled Chicken and Lobster Ravioli in a Garlic Cream Sauce – Pao Says, "Open Wide!" I seasoned each chicken breast with some salt, garlic powder, and a fresh squeeze of lemon juice. Then, I simply grilled them on my cast iron grill pan. If you don’t have one of these, you can just pan fry the chicken in a drizzle of olive oil. Cool time is about 4 minutes to a side, depending on the thickness of the chicken… Always cut into it to make sure it is cooked all the way through! I melted 2 tbsp of butter and then added about 3 tbsp of flour and combined them in a saucepan over med-hi heat. This is called a roux! The base to any good cream sauce- this will be the thickening agent… You’re already such a fancy chef. Cook this roux for about 3 minutes or so (whisking pretty constantly), and then whisk in about 2 cups of milk. **Please don’t use skim milk. If you are making a cream sauce, you’ve already committed… Just make it taste as good as possible so you can really enjoy it. I opt for whole milk here… It really does make a difference. Whisk this sauce base around until smooth. This will thicken as it all heats up. To make this sauce garlicky while still being smooth, I added a bit of garlic powder (about half a tsp or so). Also very important in a cream sauce: a sprinkle of nutmeg… If you haven’t tried it before, just trust me on this one. Then, of course, salt to taste and a sprinkle of pepper. I, personally, also like adding some Parmesan cheese to my white sauces, but that’s not mandatory… Just delicious. Lastly, I just grabbed some extra corn I had left over from my guac the other day and tossed it in. Why not. Poured contents of ravioli package into salted boiling water and cooked for 4 minutes… How simple, right?? Hooray for quick and easy AND delicious dinners! !